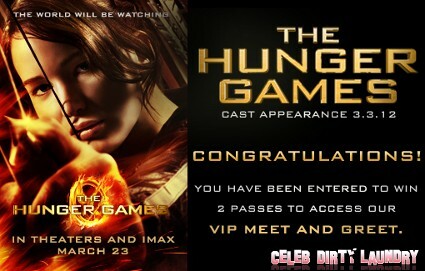 ‘Hunger Games’ Fans: Enter For Your Chance To Meet Your Favorite Stars! We reported recently that some of The Hunger Games stars will be embarking on a national tour where they’ll be participating in Q&A forums, talking about their experiences on set, and much, much more. While anyone can venture out to certain cities to see the stars from a far , how would you like a chance to personally meet director Gary Ross and stars Jennifer Lawrence, Josh Hutcherson, and Liam Hemsworth? If you’re shaking your head no right now and saying, “Why on earth would I want to meet them?” then you’re being completely LiLo crazy. Who wouldn’t want the chance to meet some of the hottest stars in Hollywood currently? Fans of the film who might be interested have the opportunity to win VIP bracelets for a special Meet-&-Greet with the stars of the upcoming film at the Westfield Century City tour stop on March 3rd. In order to enter the contest, all you must do is hope on over TO THIS FACEBOOK PAGE, “Like it,” and then submit a question addressed to either the director or stars of the film. The more friends you refer to the contest, the greater chance you’ll have of winning! We know you all are looking forward to the movie (we definitely are), so why not spice up your Hunger Games season with a little contest action. It’s easy. Just submit a question and before you know it you *could possibly be* standing in the shadow of J-Law or shaking the hand of Josh “Peeta the Badass Baker” Hutcherson. You have nothing to lose. Make sure to check out some new pics of the characters! CLICK HERE TO VIEW. If you, like me, just can’t get enough Hunger Games news, make sure to check out our special HUNGER GAMES section. We’re always on the lookout for awesome new stuff, so if you’re a fan make sure to visit us often to get all the latest News from Panem!